A quick update on progress we’ve made on our web team goals. Goal 1: We’ve made progress on launching refreshed program pages. Aviation Maintenance Technology faculty drafted virtually all their own content, and provided us with an awesome tour. Networking also went live, just this week, with updated content. I’m hopeful we’ll be launching two more right around the start of the next term. Of course, a program titled “Other” anything isn’t going to be terribly glamorous page, but it’s the best solution we’ve found for things like advertising – we don’t offer an advertising program and we don’t have a bunch (if any) advertising classes. But we’re a completely valid, cost effective start to transferring to major in advertising elsewhere. That said, those programs were fairly repetitive to write, so I probably won’t count those 5 toward our goals. Goal 2: We’ve launched a new way to view all the different programs and transfer areas we offer at Lane. You can now browse our programs in one place, rather than having to check each department’s website, and you can see them organized by career community. We’re hopeful this sorter will also support guided pathways at Lane. Goal accomplished! Goal 3: We’re actually tracking fairly well on this goal, with Organic Search sessions 4.46% higher than they were over a similar time period last year. Unfortunately, new sessions are down, so while we may be on track to meet this goal, we’re not necessarily attracting the right kind of traffic. Goal 4: There’s work happening on this one, but nothing to report yet. Expect news early next year. In the mean time, if you have any thoughts on things the Lane website does well, things it does poorly, or things you wish it would do, let me know in the comments below! All year we’ve been tracking progress on our web team goals. But now the year is over, and it’s time to reflect. We definitely made a lot of progress on some of our goals, but on others there’s only bad news. We exceeded this goal, reducing the total number of pages by 18.3%, rather than just 5%. But it turns out this was not a well written goal. Of the 1,018 of pages we eliminated, 558 of them were Lane in the News items, which aren’t really pages at all. This goal had a problem with language versus measurement. Drupal stores content internally as “nodes”. This is fairly easy to count – select count(*) from node. But there’s a number of types of content on the website that aren’t really pages but are nodes. Lane in the News items are one type, but we also have slideshow slides, FAQ questions, and landing page announcements. So while those content types count for the purposes of our metric, they probably shouldn’t. Fortunately, we still deleted 460 actual pages, so we handily met this goal. But if we set a goal like this again, we’ll probably exclude certain content types (not only the ones previously mentioned, but also news releases and board policies). While we certainly met this goal, this count has increased yet again, from 144 pages last check-in to 145. These pages remain mostly meeting minutes and policy documents. If we do a goal like this again, we should probably limit what content types we look at. It’d be really nice if there were an easy way to count words, rather than characters, but that ends up being a very difficult problem, especially when our content includes HTML mixed in. For reasons similar to goal #2, we should probably have limited what content types we looked at. We wound up at 4,194 characters, which is close to our goal. This is likely not a goal we’ll continue though, as longer form content isn’t necessarily a terrible idea. We’ve stayed steady on this goal since last post, at 17 months old. This remains one of our most difficult tasks. Despite the web team making more than 3,000 page revisions in the last year, more than 20% of the pages on the website haven’t been edited in more than 3 years – and many of the revisions we made were just link changes or typos. We’re often not qualified to do content changes. Please give us a hand! Unfortunately, we met neither of these goals. We fell the furthest behind on pageviews, where we fell 14.24%. We did improve our bounce rate by 1.11%, but that’s a long way from our 5% goal. We did have a couple of wins, which seem to indicate a more engaged audience. Average session duration is longer, people are viewing more pages per session, more sessions are from new visitors, and organic search traffic is up. In retrospect, while these were a good first attempt at goals, future goals should be more carefully targeted to what we’re trying to accomplish on the web at Lane. For instance, we could look at the percentages of traffic that come via organic search or referral, or we could look at tracking the percentage of people who request information about the college. This is our last check-ins on progress for our web team goals. The next progress post will be to evaluate how well we did and establish new goals. Regretfully, this number has slid up even further, from 5003 to 5107. Much of this has been due to news releases and in the news items (where we track mentions of Lane in news media). Next time we create goals, we’ll definitely be using a much more limited subset of page types. There’s still a bunch of open tasks to eliminate some pages, but progress is likely to be slow, as we’ve had to prioritize other work. Somehow, this measure also increased slightly again, from 141 pages to 144 pages. These pages remain primarily internal pages. With an increase in the count of longer pages, we’ve also had an increase in average page length. As mentioned last goal, this goal is no longer really one of our goals, as we’re deliberately using some longer form content. But I still don’t like that we’ve slipped to 4,140 characters. We’ve stayed steady on this goal since last post, staying at 17 months old. This remains one of our most difficult tasks, and we’d appreciate any help you can provide. Since these are annual goals, they’re a little harder to compare against. But we can compare similar time periods. For the first ten months, 6/14-4/14, comparing 2016/17 to 2017/18, our session counts have decreased by 13.67%, and our bounce rate has shrunk by 0.83%. This is a bit of an improvement on our bounce rate, but our session counts remain crushing. A glimmer of hope: new sessions are up 8.26%, and average session duration is up 9.98%. Unfortunately, we’re no longer seeing the increase in traffic on the redeveloped traffic that we used to see, though we are at least seeing level traffic on program pages. Last post in this series will be in June, when we’ll lay out some new goals for next year. Last Sunday, for the first time ever, more than 20% of visitors to the website were mobile. And I don’t think the general trend can be missed: we’re up 38% on mobile compared to last year. Just more proof that we can’t ignore mobile when thinking about the web. Also interesting? I was surprised to find that Saturdays and Sundays are our biggest mobile days. Each of the small spikes on the graph (not the gigantic ones) is a weekend. Anyone have any ideas why? Currently, we’re using the old style Google Analytics embed code, and adding it directly via our template in html.tpl.php. This works, but it isn’t optimal. For a long time we’ve known that there’s a couple users that use the website in a way that doesn’t reflect real visitors: the Lane Web Team. To take me as an example, yesterday I looked for old links to www2 urls, and found them on sixty different pages. I directly navigated to each of those pages, stayed on them for about fifteen seconds, loaded the edit window, made a change, saved the page, and left, directly navigating to another page. The statistics for that day are now ever so slightly skewed toward a person that appears to change pages at random, staying on them for almost no time at all, and who appears to come from nowhere. I’m making it harder to understand what people do on our website, and how we can serve their needs. And it isn’t just me – the whole webteam could tell a similar story. So, this weekend 9/20/14, we’ll be installing the Google Analytics module. With it, the tracking code will automatically be disabled for our administrative roles, who together represent a disproportionate number of visits. How does this impact you? Soon it will look like our traffic numbers went down – probably about 2% – just because we’re not tracking those three roles. So, if you get an analytics report mailed to you, don’t be too alarmed if the numbers go down, just adapt to the new baseline. And remember, you can always contact us if you’d like help thinking through your analytics numbers. By default, Drupal uses ugly URLs. The contact page is technically something like lanecc.edu/index.php?q=node/106. We’re using a couple of modules (Path Alias, part Drupal Core, and Pathologic) to make those urls look friendlier, like lanecc.edu/contact. But, ever notice what happens when you try to edit a page? You get another ugly url, like lanecc.edu/node/106/edit. This weekend, we’re also going to try to fix those, using the Extended Path Alias module. All of those pages that previously had a node number in them will now have a nice, aliased URL, like lanecc.edu/contact/edit. I’m sure that doesn’t seem very exciting. But it is, because when someone submits a webform, they were previously taken to a confirmation page with an alias like lanecc.edu/node/86/submission/75309. Because that url starts with /node, Drupal isn’t able to figure out which menus to include, meaning the person that just submitted your webform is effectively no longer on your part of the website. Of course, by replacing all those technical looking URLs with friendly ones, that makes it harder for you to tell us the node number, or to paste a node number into the link dialog when editing a page. So we’re also going to make it easier to find those node numbers – starting next week, just look to the right side of your screen while logged in and you’ll find a little black tab with the node number written on it. EDIT (7/9) – Unfortunately, we had to roll this one back. With this enabled, /it/somepage.html would actually go to /it/, meaning no 404 was served. We’re still looking for a solution at this time. Links will have their urls added to them, so that if you stumble across a link in a printed page that you’re interested in, you can at least type that link into a browser manually. If you notice any bugs (There’s a LOT of printers on this campus, and its impossible for me to test all of them), please let me know. What types of Computers Visit? Recently, the Webteam was tasked with formalizing the procedures we use for testing websites and applications for cross browser compatibility. When we put together our initial design, we tested against 17 different browser/operating system configurations in person, then looked at another few dozen configurations through browsershots.org. Thanks to all our testing, so far we’ve only had one browser issue – which is only in one version of Chrome, on one version of Windows, on one particular screen resolution. I’m pretty happy with that. But browser popularity changes, and people are regularly upgrading their devices. It’s been over a year since we last launched a design. Charged with formalizing procedures or not, as we get ready to develop a new theme for the Lane website, it’s time to take a look at what devices are accessing our website. For this data set, we’re actually only going to look at data from the last month – Oct 6, 2012 to Nov 5, 2012. We won’t be getting as complete a picture, but we also won’t see traffic from earlier this year, before some of the more recent browsers were even launched. We’ll start with a super high overview, then dig in deeper. So from this data we can conclude that the average (median) person visiting the Lane website is a Windows user with Firefox. Of course, we know that there’s a ton of different browser versions out there, so the story might be much more complex. But this data is still useful. Doing the same sort of extensive testing we do with the main website (millions of visits a year) with all of our sites (example: this blog, which sees about 4,000 visits a year) would be prohibitively time consuming and expensive. Testing on the latest versions of Firefox, Chrome, and IE on Windows, and then Safari on a Mac is probably good enough for most of our smaller sites. Whoa! Sorry you can’t click the little down arrow and see all three pages of the key. I’m only looking at the top 100 browser versions, and I’m combining minor version numbers (treating Firefox 3.6.3 and Firefox 3.6.5 as just Firefox 3.6.x). That still leaves us with 39 different browser/version combinations. As expected, most people use Windows. There’s no way to generate a graph of browser, version, and operating system (and it might be too complex anyway! ), so we’ll have to conclude our analysis here. But we’ve learned a few things. For one, Safari on Windows, Chrome Frame, and Linux all aren’t important to us. And we’re probably ok to stick with our high level testing plan for basic sites – it’ll still cover a majority of users. Screen resolutions are usually listed as number of pixels wide by number of pixels tall. Pixels tall can be useful to know, as it helps us determine where the “fold” is. But at this stage we’re mostly concerned with width, since that more directly impacts layout. This used to be simple to do, but with the advent of tablets that rotate their orientation, screen width has become a little more fluid: 1024×768 and 768×1024 might actually be the same device. For the purposes of our analysis, we’ll just assume that tablets don’t rotate. As long as we’ve set our media queries appropriately, things should still work. There’s something else to consider here. A device that’s 1024 pixels wide will have trouble displaying a webpage that’s 1600 pixels wide. But there’s no issue the other way. So we’re really looking for a lowest common denominator. In this case, I’d submit that our lowest common screen resolution is 1024×768. It’s ancient, yes, but it’s also the standard resolution on most tablets. Is this a good fit? I think so. It a content area gets to be too wide, it gets to be hard to read. So though it’d be totally justified to have a media query for browsers that are greater than 1400 px wide, I’d argue that it’d be hard to maintain the same look and feel without decreasing readability. And we should be ok with the tablet assumptions we made earlier – most should jump between narrow and normal view depending on orientation, but shouldn’t fall to a cell phone optimized view. 28.38% of visitors reported no Java support. Although its a free plugin, we should probably seek alternatives whenever possible. Although Google Analytics doesn’t provide us with a simple way to check Flash support, we can assume that “(Not Set)” is a reasonable guess at “Not Supported”. In this case, about 13% of our visitors don’t support Flash. Since 7-8% of our traffic is mobile, and we know that iOS devices don’t support Flash, this sounds about right. The lack of support we’re seeing here is a good reason for us to try to move away from Flash on our pages wherever possible. Compared to this time last year, mobile traffic is up 50%. We’ve got to keep thinking mobile. What devices do people use? iPhones. Followed by iPads. In fact, the next 10 devices put together only add up to 1/3 the traffic we get from iPhones. For every Android device visiting a page, there were 2 iOS devices visiting that same page. It looks Android 2.x hasn’t quite gone away, although we seem to have skipped Android 3. When testing phones, we should probably be sure to find a mix of Android 2.2, 2.3, and 4.0 devices. Now that we’ve drawn together all our data, its time to make some decisions about testing procedures. We’ll convene as a web team, go through all our data, and try to come up with a check-list. Except to see some further details soon! How do visitors find us? Last time, we analyzed where people go on the Lane website. This time, we’re going to wonder how they found the Lane website in the first place. That’s right. This post has pictures. We’ve analyzed our Search Traffic to death, and right now our Campaigns (targeted emails and such) aren’t a significant source of traffic. Direct traffic isn’t very interesting, since it’s just people that type our URL into the address bar of their browser (or are referred from an evil website that prevents us from seeing referral information – more on that later). But we can learn a lot from Referral Traffic, which we can define as visits from people who found us by clicking on a link on another website. Of course, not all referral traffic is equally interesting. I exported the top 500 referral sites (anyone who has sent at least 52 visitors last year) to a spreadsheet, and went to work. 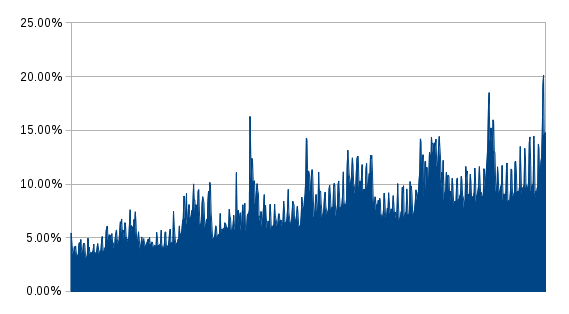 The vast majority of our referral traffic to www.lanecc.edu is actually traffic from another one of our Lane websites – Moodle, MyLane, etc. So let’s ignore those for now – although unifying navigation is a goal, we can’t also do that in this blog post. While we’re at it, let’s ignore the 7% of referral traffic that came from search that Google Analytics didn’t identify. I’m being a little generous at what constitutes search – people that are squatting on a domain and putting a search bar on it to collect ad revenue should really count as “Bad People”, but we’ll pretend they’re legitimate search engines here. We’ll also ignore AskLane, our Knowledge Base about Lane. It’s a useful tool, but people generally find it from a Lane website, so we shouldn’t count it as a distinct referrer. That’s better. It’s also not entirely accurate. The number of people who come to the Lane website via Email is likely much higher, but some email providers make it impossible to see that they were the referrer – even Google’s own email service. If you’re a department here on campus, and you’re thinking about sending out a mass email, come talk to us first – there’s things we can do to make it super easy to identify who’s clicking your email links. Let’s look at each of the other categories one by one. Keep comparing each category against the overall averages – referral traffic averages 2.98 pages/visitor, about 4 minutes on site per visitor, with a new traffic rate of 23% and a bounce rate of 55%. Google Analytics actually provides a much more comprehensive interface for analyzing Social traffic. So we’ll augment our data set. I think that graph kind of speaks for itself. And forget about the other 13 Social Networks (including Tumblr, MySpace and Pinterest), who send so little traffic that they don’t even show up. But is there a difference in the quality of traffic from Social Networks? I think it’s clear that yes, there is a difference. For pages per visit, we want the bar to be as high as possible – an indicator that the average visitor not only came to the site, but they then explored some other pages. In this case, the clear winner is Naver – a Korean Search and Social Networking Site. The biggest losers are Delicious and Facebook. So even though Facebook sends us 92% of our referral traffic, most of those visitors only view one page and then leave. We see a similar pattern in Bounce Rates (percent of people who view a page then leave. Facebook and Delicious have terrible Bounce Rates. Twitter (shown as t.co, since t.co is Twitter’s URL shortening service, and thus is the referrer) fares only a little better. But both Google Plus and LinkedIn tend to send us visitors that visit at least one other page. They also tend to send us more visitors that are new – 16% and 19%, respectively, compared to 9% for Facebook and 4% for Twitter. Lessons? Facebook is so big that its impossible to ignore, but its also some of the worst traffic. Don’t ignore the other networks. In the interest of not writing the world’s longest blog post, I won’t go into too much detail, but there’s a lot of questions to ask. Are visitors from www1.eere.energy.gov looking for info on our Energy Management program? Are the visitors from public.health.oregon.gov looking for Health Professions information? Knowing that, can we do anything to help those visitors? The averages don’t add up right, but that’s because I’m only showing the top ten here. So there’s people in Texas, looking at a list of Community Colleges, who click a link to our website. They look at some basic informational pages, and then go away. Do they come back later? (We get 29,000 visits a year from Texas, either as direct links or Search). Digging even deeper into this visitor flow, I can see that Texans are looking at many of our pages in Spanish. Should we further develop our translated pages? Having dealt with more than a couple hiring committees, I’ve always been curious to see what sites with job listings send traffic our way. Strictly speaking, the above is a pretty poor list. Most of our job postings link directly to the job post at jobs.lanecc.edu, so we may not see all the traffic in the above table. These are websites that attempt to guide you into picking a college, or provide listings of colleges with certain programs. If this wasn’t already a record long post, we could try to compare programs – do referrals for flight programs differ from referrals for health professions programs? Is there something either of these programs could learn from each other to try to drive more traffic to their pages? Here we can ask questions like: why do visitors from myeugene.org spend so long on the website? Lots of questions spring to mind. Our stats from Wikipedia are pretty good. But when’s the last time anyone cleaned and updated our page? (Answer: May 19th, 2011, when a paragraph was added about the Longhouse , if you don’t count the two pictures added a few weeks back) Our stats from Google Maps are also pretty good, which I’m happy to see – last year I spent a couple days improving our campus map on Google Maps using their mapmaker tool. But since those maps are community edited, is our listing still ok? Are there things we’re missing? Also interesting is the number of websites that simply list colleges offering a degree. 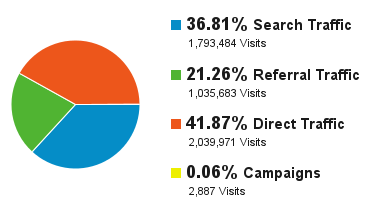 For example, 90% of visits from degreedays.net are new, and are probably people interested in Energy Management. Can we do anything with this data? Are each of those sites linking directly to the program? (degreedays.net does) Do we need to ask any of those sites to update their links, since we’re changing our url structure? (In this case, no – and this is actually a complex question. Email me if you’re concerned). Phew. That was a lot of data. I’ve only been processing it for a couple hours and I already have dozens of questions to try to answer. But I think its all important stuff to keep in mind as we continue to refine our information architecture. Are we keeping the needs of those 300,000 referral visitors in mind? If we come back to this data in another year or two and look at our bounce rates, will they have gone down, because interesting information is easier to find due to our new Information architecture? Are there any opportunities on any of those sites to increase the number of referrals? As always, let us know if you’d like to sit down and look through some more complete data for your department. The first one is the most rewarding – we’re getting rid of pages. So far, we’ve cut 5920 pages by either deleting or moving them to a separate archive site. Hopefully we’re narrowing the focus of our site and reducing the number of links that would take you away from what you’re looking for. The second two approaches are much harder, and will be the focus of this post. Both require a pretty serious knowledge of where people go our our website, as well as what people are looking for. The first place we’ll look for this data is our own internal search traffic, which we graphed a few posts ago. That gives us 50,000 searches for 3700 different terms over the last three months. We’ll scale it by a factor of 4 to get an estimate of what traffic looks like over the year. Our second source is much bigger, 1,000,000 searches on Google for 500 different terms. We can immediately throw out the 83% that are people searching for the Lane homepage. Then we can combine similar searches: in addition to obvious misspellings, like “Modle” and “Moodle”, there’s terms like “fall classes” and “spring classes” that are really just searches for “schedule”. It’s important to combine the right things – if we combine too many terms, we’re losing an opportunity to provide a more direct link to a resource. But if we combine too few, then our rankings might not be right. Our next step is to look at our actual page views. That’ll let us validate our search traffic, and tell us where our current navigation works. If a page is getting visited a ton, and no one is searching for it, then we did something right… right? Sadly, that’s a real pain to calculate due to how our data is set up. But we have a pretty good idea of where this is applicable, so I’ll hand calculate it on the half dozen pages where it’s needed. I’d rather use unique pageviews, to see what pages are important to people, rather than the pages visited most, but unique pageviews are impossible to accurately combine. But we’re really just doing a back of the envelope calculation here, just finding a starting point for our navigation. We’ll perfect it as we look at how people interact with the website after the launch of the new design. At a quick glance, we see some differences between here and the search data set. But that’s somewhat explained by looking at the pages people go to while applying for admission – the steps to enroll and /esfs/admissions. It seems people don’t search for the application, they search for the institution, then apply. But overall, there’s a good deal of overlap in our two data sets. That’s good – it means our search data is a fairly valid representation of what people look for on our website. As part of the new design, we’ll be adding landing pages for each of our visitor types. Students, Employees, Future Students, and Community Members will all have a page full of relevant links and information. Since each of those pages will be linked from the homepage, we can create a goal: within two clicks of the homepage you should be able to access all of the pages that account for at least 85% of our page views. Put another way, if you land on the Lane homepage, there should be an 85% chance of getting you where you want to be with only two clicks of the mouse. In addition to the landing pages, we’ll also have a dedicated Mega Menu on all of our pages on all of our sites. Since there isn’t as much real estate to work with, we can’t have quite as many links. But we’ll also need to use all of the data we’ve collected to build these links with the same goal – the pages people need should be easily accessible. Unfortunately, now we’ve reached the point where things get a little more subjective. Some of these links aren’t relevant for some of our visitors. Most new students don’t really care about staff instructions for accessing email. There’s still grouping to do. We can’t link to each department, but we can link to a department listing. There’s a couple options for this. Some pages, like guest lecturer information, were only relevant this last year. We need to consider marketing needs. There’s often a program or event that we’re trying to advertise to campus. We cannot ignore this need – it’s how new programs are discovered. There’s some things that aren’t links that need to be added to those pages. One example would be announcements about things like financial aid deadlines. We need to get that information out, but it won’t show up in either of our data sources. In order to avoid any bias from me, I’ll convene a group of people to dig through this data a bit more and build our links and menu using both the search data and the list of popular pages.. When we’re done, it’ll be time to start testing. Expect updates then! I was on a bike ride through West Eugene the other day, and I got to thinking about people that visit the Lane Website. What is it they’re looking for? What pages do they go to? Where do they come from? What web browsers do they use? Where are they from? I couldn’t wait to get home and find out. So as soon as I got home, I fired up Google Analytics and started digging around. It wasn’t long before I realized that I wasn’t going to just find a couple quick answers to my questions. Every answer I found raised two questions. There was a lot of exploring to do. So over the next few months, every Friday I’m going to try to make a post about analyzing some particular aspect of our website. Hopefully it’ll help us refine the designs we’ve been working with for the website redesign. We’ve been tracking visits to the Lane homepage since 2008, giving us lots of data to work with. So much with that it’s almost impossible to draw any conclusions – think about how things have changed on the Internet in the last five years! So, for the purposes of this analysis, we’ll mostly be working with data from the last year – Oct 15, 2011 to Oct 15, 2012. Bounce rate is a helpful term to know – it simply means the number of people that saw one page and left. A high bounce rate is good on some websites, where people just go for quick bits of information (like a thesaurus). But on our website, where we want people to learn and explore a little, we generally want a low bounce rate. Where do visitors go? Analyzing the pages people search for and visit on our site. What types of computers visit our Website? Analyzing the characteristics of the devices our visitors use. 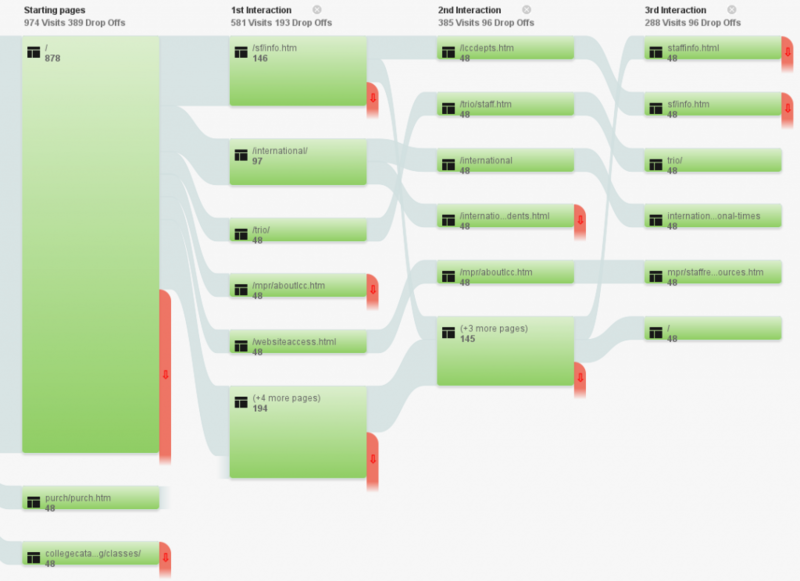 And now’s a good a time as any to plug what we can do with Analytics for your website. If you’ve got a website on campus and you’re interested in how people find and use your website, send Lori Brenden or me an email. We’ll hook you up. Academic and Student Affairs was a monster of a site – some 500 pages. In order to make it manageable, with some help from Tana Stuart over in ASA, we broke it up into a number of smaller sites, and were able to identify some mini sites that could actually be archived – publicly available, but no longer part of the core website. Kassidy Zuniga, an intern at our New Media Center, also updated the look of our archive splash page. Be sure to check out her work! Depending on how you shuffle the numbers, we’re now at 38% of pages complete, and 57% of departments complete. Many thanks to the friendly folks over at Marketing and Public Relations, who helped us move a stunning 900 pages to the archive (you won’t see anything different yet, but expect a new, streamlined news release format soon! ).